TAC II is the gaming system that I use for all my Micro Armor games, however the rules and vehicle/weapons data are in meters so the rules can be used with any scale minis. 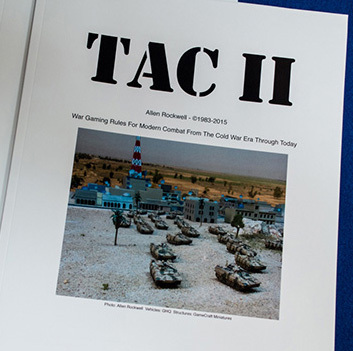 The rules for TAC II are free via PDF download to anyone that wants them, this printed version is priced to only cover my expenses of having it printed, there is no profit for me in selling this book, this is something I’m doing because I want to. If you are not familiar with my TAC II project, go to www.tac2game.com for all the info on it. Please read the entire product description in the store including the important disclaimer. This entry was posted in Uncategorized and tagged Book, Tac II by Allen. Bookmark the permalink.